I saw this article in the Guardian this morning and it made me smile. Thus, I bring you a short and fast edition of Surfing the Knit. 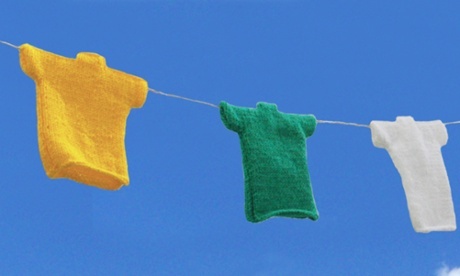 Last November, Harrogate Borough Council asked members of the public to donate little knitted jumpers to make a bunting for the town’s hosting of the Tour de France. According to the article, the idea was put forward by students at York University and the pattern for the bunting jumpers was designed by Baa Ram Ewe, a local yarn shop. The Council were hoping for 3,000 mini-jumpers but have so far received 22,000. This entry was posted in Surfing the Knit and tagged Knitting, Surfing the Knit, Tour de Bunting by knitigatingcircumstances. Bookmark the permalink. Fantastic! Lol! All knitters like making bunting. I made a box load however was defeated by the stringing it up and sewing in of ends. Lol it languishes in the loft! Now I want bunting too!